Horizon-2 is a modern cruising vessel that has been thoroughly refurbished and very well maintained with six comfortable, air-con cabins. Horizon-2 accommodates up to 12 guests in comfortable double bed or twin bed cabins. All cabins have private hot and cold water showers and each cabin has individually controllable air conditioning and lighting. Horizon-2 has a dinghy/zodiac, and is accompanied by a support dhoni – a traditional Maldivian boat ideally suited to shallow lagoons. The dhoni improves access to waves and anchorages and allows the group to split between breaks. And the main boat can be in a safe anchorage while the support dhoni allows extra dawn and evening surf sessions. 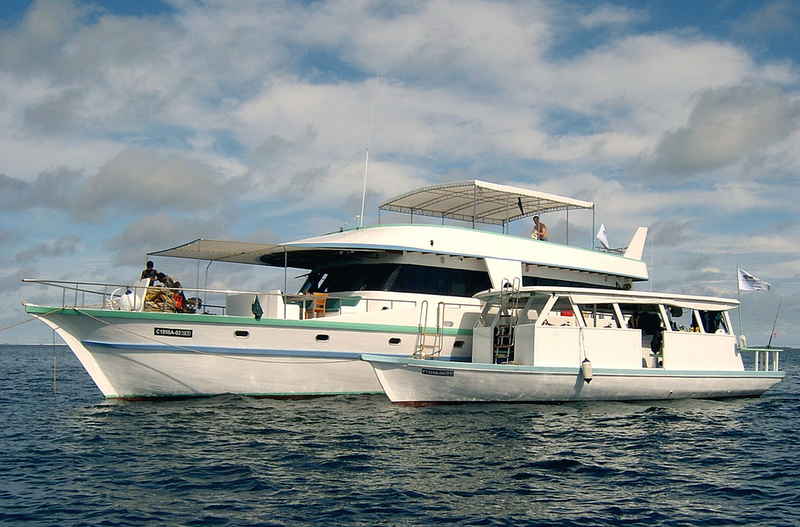 Horizon-2 is one of the least expensive boats in the Maldives, and is exceptional value for money. On-board entertainment includes DVD players, PAL / NTSC video playback, television, hi-fi stereo system and indoor board games. The skipper, Captain Waheed is the most experienced skipper in the region from over 18 years of surf charters; a local from the island of Gadhdhoo (Tiger Stripes) he really knows the local communities, the islands, reefs, breaks and most importantly the surf conditions. He doesn’t miss a call on where the best waves will be at any time of the day. The Surf Guide Kamolha also grew up on Gadhdhoo where he learnt to surf at Tiger Stripes and he’ll ensure you’ll get all the tips on each break. The awesome chef Chaminda serves up fantastic meals with a variety of European, Asian and seafood dishes served in the saloon or on the shaded fore-deck dining table. Every afternoon there’s a snack break with tea or coffee, sweet snacks and sandwiches or enjoy a sunset drink on the deck – Horizon-2 has a well equipped bar on board, serving special cocktails, whiskey, cognac, champagne, wine and beer for extra charge. Horizon-2 is powered by a very quiet 280ps DOOSAN Daewoo engine; has all the necessary safety and communications equipment including Marine Radar, VHF, Radio Telephone, mobile phone (most areas) and GPS. Electricity configuration is 220v/50Hz EU standard with 2 silent generators. The guest relations personnel and deck hands are dedicated to ensuring that our guests enjoy one of the finest of surf cruise experiences. You can snorkel on unspoiled reefs, catch a fish for dinner, and see parts of the country that most tourists never experience. My overall score of trip would be 9 / 10, I will be going again next year! The trip was fantastic with all connections and transfers well executed. The surf was exceptional with a solid supply of 3 – 6 ft. every day and Madey’s knowledge of the region was invaluable. The crew of Horizon II were fabulous and provided a first class service and quality. The chef was amazing and worked tirelessly with a creative flair that surprised even the most seasoned resort travellers in the group. We loved the boat and the set up and will be looking forward to an opportunity to do it again soon. Thanks for your help and expertise.